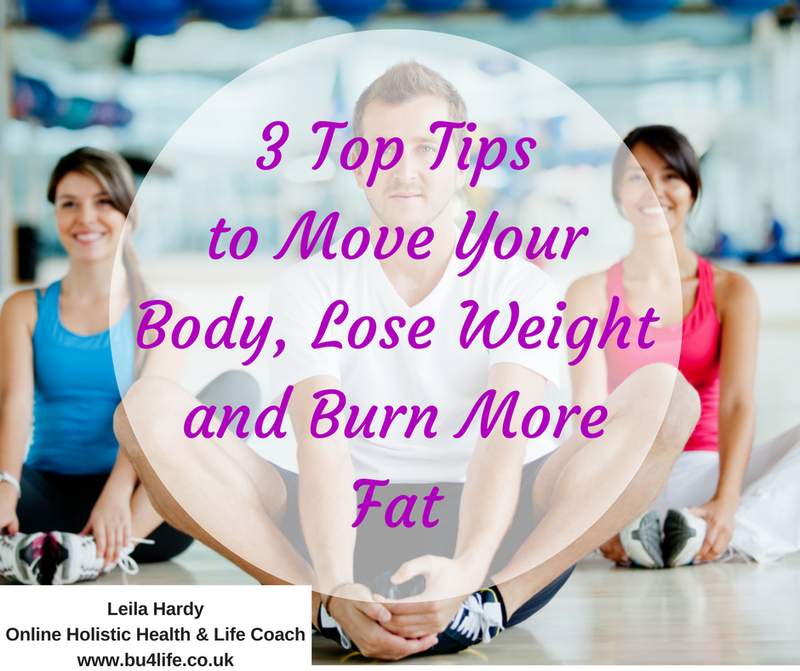 3 Top Tips to Move Your Body, Lose Weight and Burn More Fat. I want to pass on my three top tips for moving your body, losing weight, and burning more fat to you all. Let’s be fair: We all only have 24 hours in a day and we all have lots to do in those 24 hours. The best way to be able to maximize your calorific burning value, your metabolism and really work with your body and your life routine is to really maximize what you’re doing in those times. There are three really amazing ways to be able to do that, that don’t mean you have to go to the gym and flog yourself for three hours a day, five times a week. It doesn’t mean that you have to go and spend lots of time doing things that don’t excite you and that bore you, because you can maximize what you are doing in the most incredible ways that will help you feel great, help you lose weight, help you tone up, help boost your metabolism, and really help to boost your mood and your confidence. These are some of my favorite things. My background in fitness really has ignited this part of me that I love to educate and teach people on how to use your time so wisely that you can help your body, not to mention help your life, in the pockets of time, but absolutely maximize everything you do with what you’ve got and what your mama gave you to be able to have in this whole human body of yours! 1. Take time to stretch. Often when you are working hard at the gym or you are going to classes or you’re doing lots of muscular strength and endurance exercises because you think that’s going to help you burn calories which it is, but if your muscles are tight and you’re not enabling yourself to stretch your whole body, then your digestive system becomes compressed; it slows down and becomes lethargic. Your diaphragm might get tight. When that happens, your breathing gets tighter and shorter as well. As you start to stretch out and elongate every single muscle in your body right from the bottom of your feet to the top of your head and your neck, you are enabling your body to really utilize all of the work that you’re doing to help yourself to become stronger and to build muscle. You are allowing yourself to become more flexible. You are allowing yourself to have more stamina, but also allowing your body to have more endurance. This is because you’re not going to have these tight muscles that are working so hard overcompensating for all those that maybe aren’t working so efficiently. And it’s just giving you the opportunity to balance them all out, activate all the right muscles and ensure that there aren’t some that are tighter that are overcompensating which leads often to knee pain, hip pain, back pain, tight shoulders, roundedness through the shoulders and the chest. As you start to stretch all of these out, you can move your body better, you may reduce pain, if not completely eliminate pain, you will have incredible digestion, and you will be able to get your body moving in the most incredible ways internally which will allow you to burn more fat even when you’re resting and not exercising. 2. Activate your core muscles. If not all the time consciously, then give yourself the opportunity whenever you remember to activate your core muscles. The obvious core muscles are the abdominals, the obliques that form the shape of our waist. But internally, we have the transverse abdominis- the TVA, the pelvic floor muscles, the QL- quadratus lumborum, and also we have the psoas muscle which connects the lower back through to the hips and the thighs. All of these inner core muscles when they are working efficiently, not only are the – again – boosting your digestion, but they are holding you up well. When they are working well and are strong and supple, remember these are the muscles that you don’t see beneath the skin, you are literally doubling, tripling, quadrupling the muscle capacity and what’s going on in your body, which will be burning more calories which will be helping you to develop more muscle, better posture, and also improve the movement of your body in every sense of the word. Your core muscles surround all your internal organs around your digestive system. When these are strong, when these are working really well, then you are generally every day massaging your digestive system - your intestines. You’re allowing things to move through. You’re helping the waste products to get out of your system much better. And that, of course, is where we store a lot of our weight; in waste products, plaque and toxins. So, to help eliminate those is going to be so powerful. To do that, briefly allow yourself to stand up or sit up nice and tall and imagine you have a wide belt around your middle from ribs to hips. Imagine that wide belt just gently tightening to around about notch number three or four of ten notches on that imaginary belt. Notch 10 will be so tight you can’t breathe but notch three or four is comfortable for you to be upright and to breathe. You will notice your posture change too, but you are starting to bring in and support all of those muscles. Then allow yourself to pull up and draw up with your pelvic floor muscles so you get that sensation that you are gently sucking yourself in and all the way up and zip yourself up through the middle. As you do that you are going to start activating your transverse abdominis, your pelvic floor and those inner core muscles which are going to absolutely power you through and help you to lose weight, burn more fat, and move your body in a really efficient way. You may have heard of this before but Neutral Spinal Alignment is a position that gives your body the optimum position to be able to function really well. It ties back in to having muscles working and balanced together really well. Neutral spine can be done sitting, standing, or lying down. What you need to do is make sure that when you go about your day in any of those positions, that your feet are on the floor shoulder width or hip width apart. Give yourself the opportunity to imagine that you have three spots at the bottom of your feet; one under the ball of the big toe, one under the ball of the little toe, and one in the center of the heel. Really imagine bringing your weight evenly onto those three spots. What happens is quite often we lean in too far forwards or we might be leaning too far back; we might be leaning out to one side or into the middle of the foot. When you start to rebalance and neutralize your pressure, you are then creating a downward force that is very even on all of your joints. What you can then do is work up the body; soften your knees slightly so they’re not completely bent, but they’re not totally straight either. Then allow your hips to just gently balance as if you have a bowl of water in your pelvis and that bowl of water sits nice and level. The extreme of this may be tipping back, it might be tucking your bottom under, or tipping it forward as you’re really sticking your bum out. Find that middle point where you’re in that neutral position again. We’re just creating this downward force that feels even and balanced all the way through. Once you’ve done that, engage your core muscles, roll your shoulders back, press your head up towards the ceiling as if you’ve got somebody pulling you by the crown of the head and give yourself the opportunity there to just have a feel of what that feels like with your arms down by your side. Try it walking around, sitting up, sitting in your car (most people have to change their rearview mirror position once they’ve done this in the car) and also lying down. Lying down will be if you are exercising on the floor - make sure your feet are flat on the floor and your knees will be bent. In this example, that bowl of water will still be nice and level but remember you’re now lying horizontally. You will have a big arch in your back if you are tipping it forwards and you will be flat on the back if you are tipping it back. You want to be just in that middle point where you can slide two to three fingers underneath the small of your back when you’re lying down. And then you can work through the same process - roll your shoulders back and down by your side on the mat and stretch your head and neck up and away from your shoulders and your chest. When you start to give yourself that optimal alignment, you are giving your body the most incredible gift to not only protect you and preserve you in the most incredible way when you are exercising or moving your body, but also to stretch out and allow all those inner parts of you – the organs, the muscles – to really be supported and to support you in the best possible way as well. Do you have any questions about this, or anything else? Don't hesitate to ask away in the comments, or alternatively, book a call with me to discuss your individual needs!